During New York Fashion Week, this season, I had this great opportunity to visit the new Romona Keveza opulent and chic atelier, the Penthouse at One Rockefeller Plaza with a breathtaking view and a rather ‘homey’ atmosphere. It really felt like home but in Upper East Side terms of describing it! 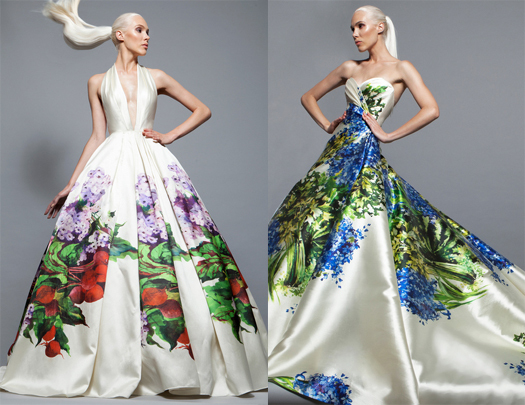 The designer’s fit model was there to present as many fabulous gowns as possible from SS16, and the first thing that caught my attention was indeed the quality of the fabrics. Silks were sweeping the floor graciously, following body contours and forming attention-grabbing drapery. Minimalism seemed to be inherent in these great examples of eveningwear, but every now and then, you could see an intricate embellishment strategically positioned to give a certain effect. Delving more into the design process and the logic transcending their manufacturing, I soon realized how much Romona Keveza cares about fit and convenience. Even her most structured gowns were not restricting the body, based on some techniques and materials that mold around the silhouette and allow movement. Stretchy elements, artful cuts, and hidden functional details enable women to feel comfortable and confident in their own eveningwear, being capable of dancing and mingling on a special occasion, a wedding or other engagement. And it sounds rare, because I’m usually receiving an array of complaints regarding special occasion clothes that are not easy-to-wear, or questions on ‘how can we eventually be dressed up in style but also in convenience.’ But Romona has dressed the elite of the red carpet – including Lady Gaga, Angelina Jolie and Jessica Alba – so she really knows how to produce a 100% wearable evening gown that looks impeccable and stunning from all four for angles. She is a perfectionist and that was not only obvious through the details of her dresses but also through the ambiance she has created in her own atelier. It’s a space designed to sooth all anxieties, to put you in a dreamy mood, and make you choose what really fits your vision about ‘the perfect dress’. And this is more of an imperative when a woman chooses outfit for a very unique moment in her life, from receiving an Award to getting married. 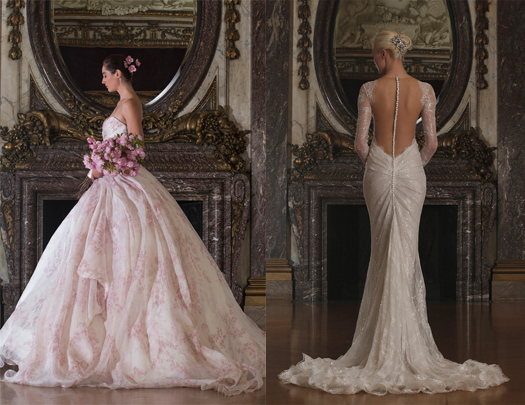 Bridal is her forte, with a range of wedding gowns that are the closest possible to a real-life fairytale. As with her eveningwear, that is glamorous yet modern and young, Romona insists on a redefined version of Hollywood Glam, most probably because her experience comes from a mix of cosmopolitan clients from all over the world. Zooming on various of her dresses, I got the mesmerizing feel of the immaculate slits and cut-outs, the daring prints (one of those mixing hydrangeas with beetroots) and the figure-flattering tailoring tricks. There were small parts of the dress that could be removed to give a different style or could be relocated to serve a different need (such as the long silk train you could also lift and hold as a stole). The designer also remains adamant in employing and supporting the best of local talent, a move that more and more designers should become part of. Her attitude and creative sensibility has been appreciated by an impressively diverse high fashion clientele. She has dressed Jane Fonda in the same memorable way she did it for Kendal Jenner, Taylor Swift and Kelly Osbourne. Under her ‘magic spell’ all ladies look like modern-day princesses! On my way out I saw all those dazzling red carpet looks framed on the walls at the entrance hall, which I’m sure it will be constantly updated with more happy faces and gorgeous silhouettes. Till my next visit to Romona, I shall be dreaming!